Protozoa are unicellular organisms that range in size from a few microns to several hundred microns. Most protozoa are free-living in soil and water and enter the activated sludge process through inflow and infiltration. The number of protozoa within the activated sludge process or mixed liquor varies greatly by process and operational conditions, especially hydraulic and organic loadings. The relative abundance of protozoa may be less than 100 per milliliter or greater than 100,000 per milliliter. • recycling of mineral nutrients. Bacteria are the primary food source for protozoa, and the consumption of suspended or dispersed bacteria by protozoa is referred to as “cropping” action. Cropping action removes many dispersed bacteria from the bulk solution. Dispersed growth as well as colloids and particulate materials, collectively known as “fine” solids, also are removed from the bulk solution by the “coating” action of ciliated protozoa. This group releases “sticky” secretions that cover the surface of fine solids. Through coating action, the surface charge of fine solids is made compatible for adsorption to floc particles in the activated sludge process. The adsorption reduces the quantity of fine solids in the final effluent. Protozoa also release excretions to the bulk solution. These excretions contain many mineral nutrients, including nitrogen and phosphorus, and help to recycle mineral nutrients in the activated sludge process. These nutrients then are available for bacterial activity in degrading wastes, the biochemical oxygen demand (BOD). Another role assigned to protozoa by many wastewater treatment plant operators is their use as “bioindicators” of the health of the activated sludge process. Protozoa in the activated sludge process commonly are placed in one of five groups: amoebae, flagellates, free-swimming ciliates, crawling ciliates, and stalked ciliates. Amoebae and flagellates are considered “lower” life forms, while crawling ciliates and stalk ciliates are considered “higher” life forms. Free-swimming ciliates are considered “intermediate” life forms. Some treatment plant operators often perform routine microscopic examinations of the protozoa in the activated sludge to determine the health of the activated sludge process. Typically, operators base the health of the process on the protozoan groups that are dominant as revealed by microscopic examination (Table 1). For example, if lower life forms are dominant, the activated sludge is considered unhealthy and unacceptable. An unhealthy activated sludge produces an aeration tank effluent having a BOD greater than 30 mg/L. If the higher life forms are dominant, the activated sludge is considered healthy and acceptable. A healthy activated sludge produces an aeration tank effluent having a BOD less than 30 mg/L. Amoebae Rarely predominant except for start-up conditions and conditions that mimic start-up such as over-wasting, recovery from toxicity, washout, and organic overloading. Flagellates, plant-like Dominant under high organic loading, dispersion of floc particles, such as through chlorination, and start-up conditions or conditions that mimic start-up. Also may dominate in the presence of excess soluble phosphorus. 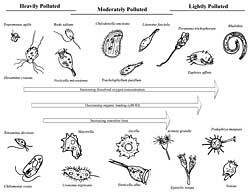 Flagellates,animal-like Except for the presence of excess soluble phosphorus, these are dominant for operational conditions listed for plant-like flagellates and usually follow plant-like flagellates as the dominant group. Free-swimming ciliates Transition group that dominates between healthy and unhealthy conditions and proliferates when large numbers of free-swimming bacteria are present. Crawling ciliates Dominant in the presence of mature floc particles and low biochemical oxygen demand (BOD) in the bulk solution. Alternate with stalked ciliates as the dominant group. Stalked ciliates Dominant in the presence of mature floc particles and low BOD in the bulk solution. Alternate with crawling ciliates as the dominant group. Operators should exercise caution when correlating final effluent quality with the health of activated sludge as indicated by the dominant protozoan groups. For example, loss of secondary solids from the clarifier due to a bulking condition would increase the BOD above that achieved in the aeration tank. Amoebae are slow-moving protozoa. They possess a cytoplasm that “flows” against a thin, flexible cell membrane. The flowing action “pushes” the cell membrane and provides the organism with locomotion. Extension and contraction of the cell membrane caused by the flowing action of the cytoplasm is referred to as a pseudopodia (“false foot”) mode of locomotion, which is used to engulf or capture substrate. Two types of amoebae commonly are found in activated sludge processes: the naked amoebae, such as Actinophyrs, Mayorella and Thecamoeba, and the shelled or testate amoebae, such as Cyclopyxis and Difflugia. The naked amoeba has no protective covering. The testate amoeba has a protective covering or testate that consists of calcified material. Flagellated protozoa are oval in shape and have one or more whip-like structures or flagella. The whipping action propels the protozoa through the activated sludge in a “cork-screw” pattern of locomotion. While in motion, flagellates accidentally “hit” substrate. With decreasing numbers of suspended bacteria, flagellates find it more difficult to find substrate. There are two types of flagellates: the animal-like flagellate such as Bodo, Hexamitus, and Peranema, and the plant-like or pigmented flagellate, such as Euglena. The pigmented flagellates contain chlorophyll and are known as motile algae. The three types of ciliated protozoa are free-swimming ciliates, crawling ciliates, and stalked ciliates. All of these have short hair-like structures or cilia that beat in unison to produce a water current for locomotion and capturing bacteria. The water current moves suspended bacteria into a mouth opening. Free-swimming ciliates such as Litonotus and Paramecium possess ciliate on all surfaces of the body and usually can be found suspended or swimming freely in the bulk solution. Crawling ciliates, such as Aspidisca and Euplotes, possess ciliate only on the ventral or belly surface where the mouth opening is located. Crawling ciliates usually are found on floc particles. The beating action of the cilia on the surface of floc particles gives the impression of tiny creeping or crawling “legs.” Some of the cilia are modified to form “spikes” that help to anchor the organism to the floc particle. Because the use of controlled water currents is an efficient means of capturing bacteria as compared to the use of flagella, ciliated protozoa can out-compete flagellates for bacteria as the population size of suspended bacteria decreases. Stalked ciliates, such as Carchesium and Vorticella, have cilia around the mouth opening only and are attached to floc particles. Stalked ciliates have an enlarged anterior portion or “head” and a slender posterior portion or stalk. Some stalk ciliates, such as Vorticella, have a contractile filament within the stalk that permits springing action. The beating of the cilia and the springing action of the stalk produce a water vortex that draws dispersed bacteria into the mouth opening. Of all ciliated feeding mechanisms, the stalked ciliates mechanism is the most efficient in capturing bacteria. Another small and interesting protozoan group that often is placed with the stalked ciliates with respect to bioindicator value is the tentacled stalks or suctorians, such as Acineta and Tokophrya. The immature protozoa possess cilia. As they develop, they lose their cilia and develop tentacles. The tentacles permit them to feed upon other protozoa. • the relative abundance of dispersed bacteria decreases. Favor protozoa with short generation times: small flagellates and small ciliates. Slow flow rates Favor protozoa and metazoa with long generation times: crawling ciliates, stalked ciliates, suctorians, rotifers, and free-living nematodes. High organic loadings Decrease dissolved oxygen concentrations that favor protozoa that can survive anaerobic conditions: amoebae, flagellates, and small ciliates. Low organic loadings Permit high dissolved oxygen concentrations that favor strict aerobic protozoa and metazoan: crawling ciliates, stalked ciliates, suctorians, rotifers, and free-living nematodes. These changes permit higher life forms, ciliated protozoa, and metazoa to proliferate in number and diversity. Decreasing numbers of dispersed bacteria also contribute to the change in dominant protozoan groups as the more efficient food-gathering mechanisms of crawling ciliates and stalked ciliates permit them to out-compete other protozoan groups for the bacteria. Therefore, a general trend in progression of lower to higher life forms can be observed with decreasing pollution or BOD, increasing DO concentration, and decreasing numbers of dispersed bacteria -- that is, crawling ciliates and stalked ciliates become dominant under healthy activated sludge conditions. Conversely, with deteriorating conditions, a regression from higher to lower life forms occurs. Unhealthy conditions include organic overloading, slug discharges of soluble organic wastes, undesired changes in pH, inhibition, toxicity, and loss of solids. Because the activated sludge process is a biological system, the protozoa in the process are affected by changes in composition of the wastewater and the microbial community, flow, organic loading, and temperature. The most significant factors affecting protozoa are flow and organic loading or carbonaceous BOD (cBOD) (Table 2). Flow determines the time available in the process for the protozoa to reproduce, while organic loading influences DO availability. These two factors exert the most influence on the succession of protozoa groups and species of protozoa that are dominant. Changes in flow affect solids retention time in the process as measured by mean cell residence time (MCRT). Increasing flow decreases MCRT, while decreasing flow increases MCRT. Because each species reproduces at different rates (generation times), increasing flow favors protozoa with short generation times, while decreasing flow favors protozoa with long generation times. Organic loading influences DO availability. Unless DO is adjusted, increasing organic loading decreases DO concentration and favors the proliferation of tolerant protozoa, regardless of MCRT. Conversely, decreasing organic loading increases DO concentration and favors the proliferation of protozoa that survive in large numbers under a relatively high DO concentration. Due to differences in specific generation times and ability to survive under differing DO concentrations by some protozoa in each group, the presence of specific protozoa (Table 3) rather than dominant groups may be used to determine the health of the activated sludge process. Species of protozoa as well as groups of metazoan may be correlated with major operational conditions and the health of the activated sludge process. Major operational conditions include MCRT, DO concentration, and organic loading (cBOD). Changes in dominant specific protozoa are indicative of favorable or unfavorable conditions occurring in the activated sludge process. Routine microscopic examination of the mixed liquor can provide an operator with an early warning of unfavorable loading conditions and inappropriate process control changes. • Curds, C. 1969. “An Illustrated Key to the British Freshwater Ciliated Protozoa Commonly Found in Activated Sludge.” Water Pollution Research. Ministry of Technology. H M S O, London. • Schuyler, R. G. and S. K. Schuyler. 1993. “Microscopic Identification of Ciliated Protozoa.” Operations Forum. Water Environment Federation. Alexandria, Va. (8). Although the Curds’ reference is old and out of print, it may still be obtained at university libraries or through interlibrary loan. With the use of these references and some practice, the identification of protozoan groups and specific protozoa becomes easier and the required time for identification decreases. The value in using protozoa as bioindicators and a troubleshooting tool should be accessed. This tool may be useful in providing early warning indicators of unfavorable changes in operational or loading conditions. Aside from toxicity, protozoa usually respond to significant changes in their environment within 24 to 36 hours.